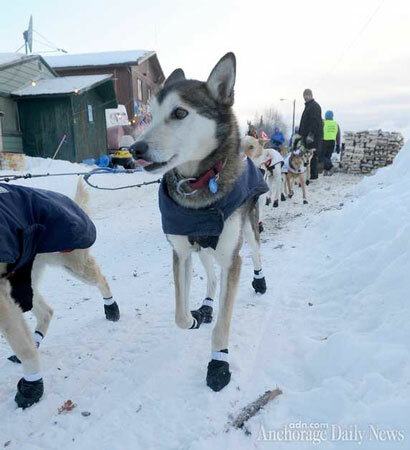 Critical Section - Iditarod day 5 - to the Yukon, Jack! 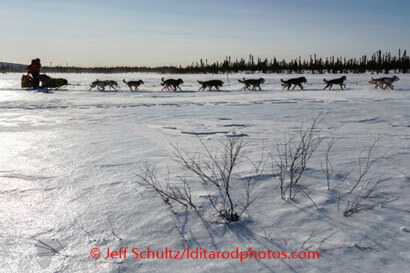 Iditarod day 5 - to the Yukon, Jack! The 2014 Iditarod moves into the halfway point, with the leaders all having "taken their 24s" and moving to the Yukon River. Every musher is required to take another 8-hour stop along the Yukon somewhere, in a checkpoint, so that vets can examine their team closely. The current leader on the trail is Jeff King, closely followed by Sonny Lindner; they are both camped out in Ruby, taking their 24-hour break there. 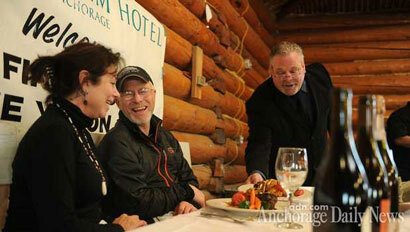 (That's Jeff at right, celebrating the nice dinner he received for being the first musher to the Yukon.) These are ones using the "rest late" strategy. But the real leader is Martin Buser, who is heading into Ruby with a full head of steam, having taken his 24 long ago. He's using the "rest early" strategy. And a few hours behind Martin are a whole host of other competitors, led by Aliy Zirkle and Robert Sorlie, who have also taken their 24s back in Takotna (the "rest middle" strategy). And don't forget Mitch and Dallas Seavey, father and son champions in 2012 and 2013, close behind. That's Mitch and team at left. Some of these mushers will take their "8" in Ruby, others in Galena a bit further down the Yukon, and others yet in Nulato. Most observers think Buser will take his 8 in Ruby, and Zirkle in Galena; King and Lindner, having just completed their 24s, will probably take their 8 as far down the river as possible, probably in Kaltag. Sorlie is an unknown and he isn't saying, even in his native Norwegian.